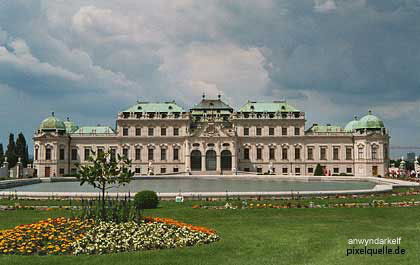 Schloss Belvedere Castle was built for the Habsburgs' General Prince Eugene of Savoy. After his victory over the Turkish armies in the early 18th century, the Habsburgs could consolidate and modernise their empire. They thanked Eugene with gifts and bonuses that would beat every modern investment banker. Eugene in turn built castles like crazy, with Belvedere as the most elaborate. He was also bibliophilic and the core of Austria's National Library is Eugene's collection of books. If you look at this picture, you might see the resemblance of Belvedere with a Turkish tent: This should commemorate Eugene's victory and claim to fame.